Yesterday was a hugely exciting day! I know it has been around for years but I have never had the chance to see it...until now...ready for it? I finally got to see Wicked! I had been waiting for it since booking the tickets last October, I think its fair to say that I could hardly contain my excitement - leaving everyone around me a little sick of hearing about it. The tickets we booked were for the show in Glasgow, which is maybe just over an hours drive for us...normally we would go to Edinburgh for a show but Wicked won't be there until the end of this year and I could not wait! Because we were going that bit further we thought we should make a day of it, and I had planned to document the entire thing but apparently, the excitement made me a very bad blogger and I took hardly any pictures. I couldn't really take many at the show as photography was not allowed during the performance but I did get a few snaps of dinner so I thought I would share them with you. We ended up at Jamie's Italian, if you have never been I highly recommend it. Having booked quite an early dinner, 5pm, we nearly had the whole place to ourselves. The staff were very friendly and happy to help with or explain anything you would like. Every time we visit, I say I am going to get something else to start -I never do. So once again I had the Arancini, well we both did actually. It was very good! I think I could eat a whole bowl of them if given the chance. For main I had Gnudi, to be honest I had never heard of it before but it was very tasty. Gnudi is ricotta dumplings and it was served with sage, lemon and parmesan butter -yum yum! Paul had what he has each and every time we go, The Jamie's Italian Burger. His verdict on it was excellent as always. I was way too full for dessert but Paul ordered The Epic Brownie...with two spoons because he is sweet like that. I did try it but only one mouthful because I was very full! Not pictured was the bread plate we also had, the main cause of the fullness. The brownie was delicious and came with salted caramel ice-cream and amaretto popcorn. After dinner we had a long but casual walk to the The Kings Theatre, me becoming more and more excited with each step. While as I said, we could take picture of the show I did get a couple of the stage before it started. How amazing is he! He moved during the show. And just in case you get lost, a map on how to get back to the Emerald City. I won't say much about the show in case any of you are off to see it some time soon, but I will tell you that you will not be disappointed...it is just amazing! 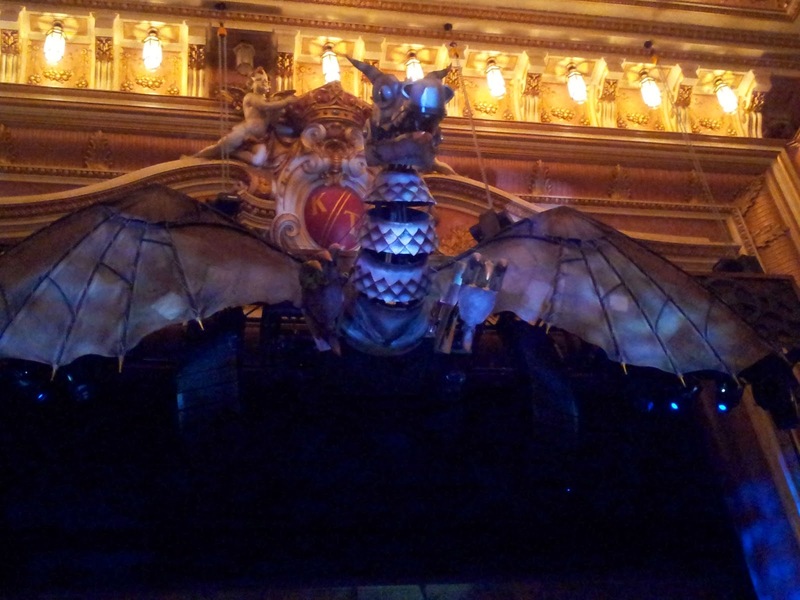 Everything about it from the cast to the props were just perfect and I cannot find a bad word to say about it. Have you seen this show, what did you think? I love Jamies and I too have had the ultimate brownie. It is pretty darn good! 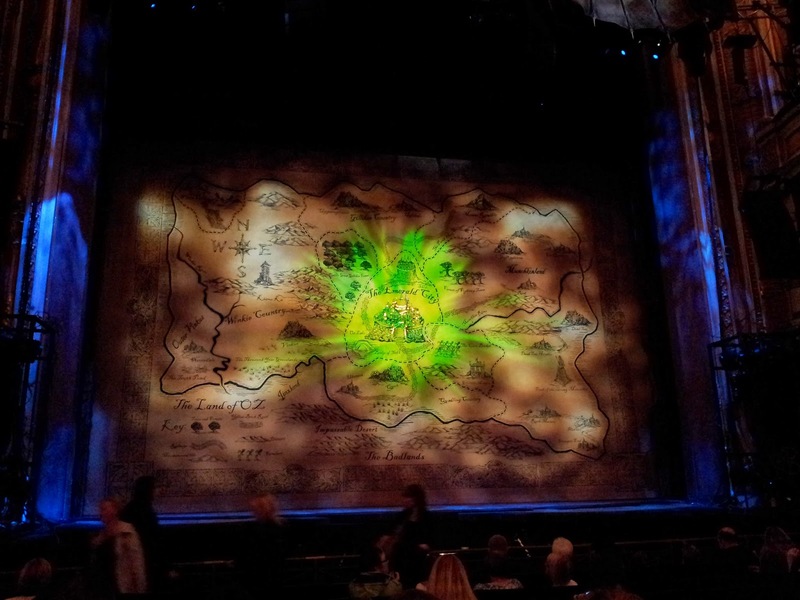 I hope you enjoyed Wicked, my friend saw it is Glasgow and raved about it!